Which book says, "Not by might nor by power, but by My Spirit? Purchase of Mr. Armstrong's first car, and the slow, uphill climb of the broadcast, Plain Truth, and evangelistic campaigns, punctuated with a few sparkling incidents, are related in this 34th installment. We had come, in the 33rd installment (December, 1960, issue), to the spring of 1935. Now I should like to backtrack briefly. The broadcast had starred the first Sunday in January, 1934. 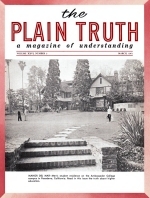 The first issue of The Plain Truth, mimeographed, came out February 1, 1934. The third point of the "Three-Point Campaign" got under way the first of April, with the evangelistic campaign in downtown Eugene, Oregon.